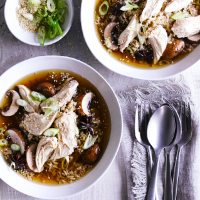 This is a simple, speedy and nourishing broth. The flavours are delicate but wholesome – add a squeeze of lime and some fresh red chilli if you enjoy an added kick. 1.Put the stock, rice wine (or sherry), soy sauce, ginger, star anise and chicken in a large pan with 750ml water. Bring to the boil, then simmer over a medium heat for 10 minutes; remove the cooked chicken and keep warm. 2. Add the rice to the poaching liquid, cover and cook for about 25-30 minutes, until tender. 3. Roughly shred the chicken and return to the pan with the mushrooms and white parts of the salad onions; simmer for 1-2 minutes. Serve in bowls scattered with the green salad onion tops, plus some toasted sesame seeds and a drizzle of toasted sesame oil, if liked.